I know why his eyes are closed here, but when I first saw this I thought more of his death than of anything else. I thought he was deep into his music when I saw his eyes were closed. Straight forward cover and I like it. I like it too. It just made me sad to remember he's not here anymore. Its a beautiful cover. Perfect. This cover design is very similar to the cover we designed at the publishing company I used to work for a couple of years ago...the designer was one of my employees. 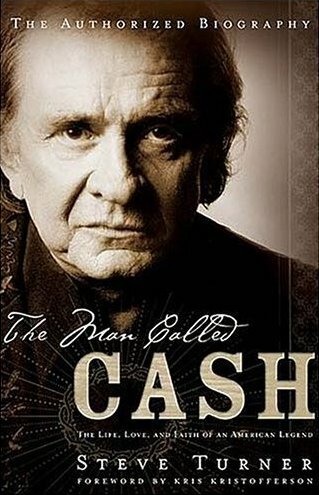 It's called The Man Called Cash by Steve Turner. Check out the cover...I'd be interested in what people here think about the commonalities in design. I find it slightly alarming. Karen, I checked the cover for A Man Called Cash, and I see some basic similarities. 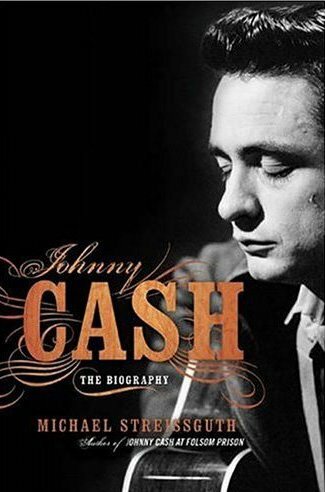 There is a photo of Johnny Cash on the cover and a use of woodtype, but that is a commonality of most of the Cash bios out there. Take a look - I did a search on Amazon and its funny to see. How does a reader discern which to buy? But between the book your designer did and this one posted here, the toning of the photos, the placement of type and colorization, and the use of flourishes are different enough to me. And, sorry, but I do prefer the new one - there's a feeling of flames licking his name, which brings up memories of Ring of Fire, and the composition is very strong and moving. It taps into the mourning and nostalgia in almost a subconscious way. It'd be interesting to post more Cash covers, though, to show how the ideas on how to promote these books come from a smallish idea pool. Oh, don't get me wrong...I think the new cover is spectacular. And I agree there is just enough difference between the two to keep things safe. But me personally as a designer, I would have gone to greater lengths to not look like I was mimicing any one cover or a group of covers. That idea pool that you refer to does indeed exist and designers should make sure and not get bogged down it. But hey, there's also the strong possibility that the marketing department demanded it be this way! bbI prefer the cover with his eyes closed. It has a more intimate feel to it, as though I happened upon him, all alone, playing guitar. Greetings! The Internet is a rubbish pit of the world! How many mucks I he met! But your site only pleases me. Thanks the founder for his its insight and resource. Good-bye! .You the admirer.